Okay, Thanksgiving Day is finally here! The shopping is done, the relatives are on their way, and the table is set. Time to focus on the dinner centerpiece – the turkey. In the past few years, home cooks have tried lots of variations on cooking the Thanksgiving Turkey – barbecuing, smoking, deep frying – but most of us still put it in the oven to bake. What’s the secret to a well roasted turkey? What are the steps you need to follow for a flavorful, juicy main dish? Well, we’re glad you asked. . .
First, thaw your bird completely. Not mostly. Not part way. All the way. You can thaw it in the fridge for a few days – up to four, depending on the size of your turkey. What if you don’t have four days? Well, you can cover your (still wrapped) turkey with cold tap water in the sink, changing the water every half hour. It will take about 30 minutes per pound to thaw. As a worst case scenario, you can also thaw your bird in the microwave (be sure it fits!). Check the owner’s manual for what setting you should use, and for how long. 2. Rinse, remove, and season. 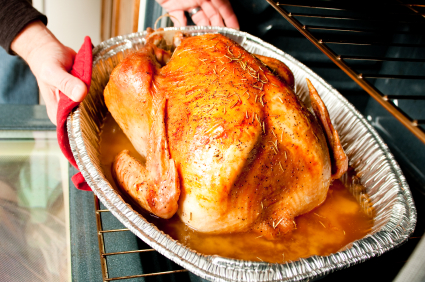 Once the turkey is thawed, rinse it thoroughly with cold water – inside and out. Make sure you remove the bag of giblets from the cavity, but don’t throw them away! In a small saucepan, boil the neck, heart, gizzard, etc. until they are fully cooked. Then strain and use the broth as the base for your gravy! (You can give the meat to your pet or chop them and add them to your gravy for giblet gravy). Season the turkey with salt and pepper and rub soft butter in the cavity. Then loosen the skin on the breast and push some butter (and herbs if you like!) into the pocket. 3. To truss or not to truss? Trussing your turkey is not required, but it can make the turkey look better, cook more evenly, and carve more easily. Most commercial turkeys come with a metal loop that brings the drumsticks together, and that will accomplish most of these objectives. If you want to use kitchen string to be more fancy, check out Food Network.com’s Alton Brown’s tutorial here. There are competing opinions on whether to roast at a high temperature for the first half hour to get a nice brown skin, and then lower it (no lower than 325°F) for the remainder of the cooking time, or keep the oven at a nice medium temperature for the duration. 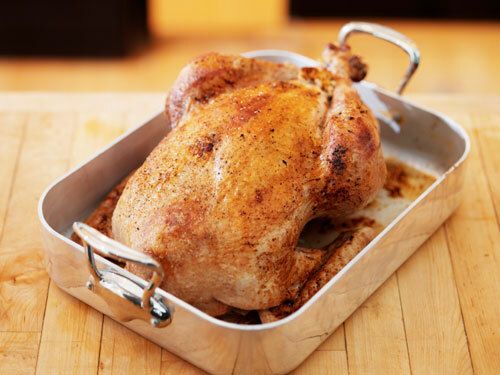 In our opinion, 350 – 400°F is probably the best temperature for cooking a whole bird. Baste the bird with butter periodically while cooking to ensure brown crispy skin. (Terrible for you, but fabulous to eat. It’s the holidays after all!) But be sure not to open the oven door too often, so you can maintain an even temperature. It may be tradition, but current thinking is it’s not a good idea. . . Baking stuffing in your turkey can lead to all sorts of holiday misery – namely salmonella – if you don’t cook it until you’ve reached an internal temperature of at least 165°F. So be careful, be vigilant, and be safe. Or, just cook the stuffing in a separate roasting pan. Let your turkey rest for at least 20 minutes after you take it out of the oven. That will let it cool just enough so all of the juices will settle back into the meat, instead of running all over your cutting board when you carve it. Don’t waste the juices and brown bits the bottom of the pan! Pour them all into your gravy separator (or a tall, skinny container). Let the fat rise to the top, skim it off, and use that broth as the base of your gravy. Brown bits stuck to the roasting pan? Pour a little white wine in the pan and stir over medium heat. They will dissolve and add tons of flavor to any sauce! And finally, as you serve your delectable main course to those who have gathered with you to give thanks, remember this: Thanksgiving comes every year. If things didn’t come out perfectly this time, you will have another shot at it. And another, and another, and another in the years to come. In the meantime, good gravy can cover a multitude of sins. Relax, be thankful and enjoy your turkey with family and friends.